Now would be a good time to get yourself a Gold Chocobo. This is the first occasion to get one, and it's good to have a reasonably well-grown Knights of Round materia around for the big end battles. For more on breeding, see the Chocobos page. To advance the game, your next stop is Junon. In Junon, head up to the airport. The basic idea of this section is to head to the Underwater Reactor. You go down the tunnel that begins from the upper level by heading the way you went to the cargo ship, until you come to the narrow tunnel to the left where Shinra soldiers are doing drills. They head to the tunnels. Fight your way through the relatively easy enemies, go through the seafloor tunnel, take elevator up, fight more soldiers, and stop Reno from loading the Huge Materia into a submarine. In the seafloor tunnel you can morph the Ghost Ship enemies into Guide Books, which is the item the trader in Kalm wants. You can trade them for Underwater materia, which can be handy when fighting the Emerald Weapon. Reno gets the thing packed to the sub despite your efforts, and leaves in a hurry while you fight the next enemy boss. With Knight of the Round, this enemy is a one-hit knockout. While it may get in an initial attack, this powerful summon should be able to dispatch Carry Armor before it does too much damage. Without Knight of the Round, this fight can be considerably harder. The boss consists of three parts: The body, Carry Armor, and arms, Left Arm and Right Arm. Each is a level 45 creature, though obviously the body has higher stats. The body has Lapis Laser, which kills your party dead without any precautions, and the arms can grab the characters. The arm grab means the grabbed characters get damaged as well when you damage the boss, and worse, it can grab up to two characters. No might in the world will make it let go of the characters until they're dead, so revive your fallen comrades immediately - if your remaining kicking member gets grabbed, the fight ends unhappily! Good protection (MBarrier or Big Guard) is essential. Some techniques are effective, among them everything that has anything to do with lightning, including Bolts, Ramuh a little bit, and Magic Breath and Trine Enemy Skills. Aside from those, hit the boss with everything and anything. Carry Armor leaves God's Hand, a nice weapon for Tifa. After the fight, you take the the other sub to catch Reno. In the submarine bay, be sure to check every box. You'll find Battle Trumpet (for Cait Sith), Scimitar (a weapon for Cid that has triple materia growth rate) and Leviathan Scales, a key item which will douse the flames in the Wutai cave. In the other sub, you first need to fight your way in. There's a save point in the entryway. In the command cabin, you have the option to fight the commander and two soldiers, or you can take them hostage. Speed after the red sub, and when you get a lock-on fire the torpedoes. If you fail you don't get the Huge Materia, so hopefully you saved back in the submarine bay. If you succeed, the enemy sub stays safe in the bottom of the ocean until you grab the Materia, so no need to hurry. You get orders to return to Junon, and when you get back you see an airplane going to Rocket town. The next destination is Rocket Town. New item chests have been scattered around if you haven't been here since picking up Cid. In the room behind the weapons shop is a Fourth Bracelet, and in the item shop is a Guard Source. 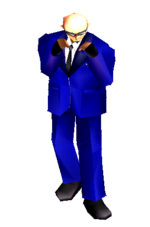 As you wander around Rocket Town, you find out the Shinra is fussing all over the rocket. As you head to the rocket, the soldiers spot you and attack you. Fight them off. If Cid isn't in your party, he comes along now, obviously eager to defend his beloved rocket. Rearrange your gear at this point if needed. Climb up. Rude and a few soldiers are responsible for this Huge Materia shipment - now it's time to fight them. Rude and his two Attack Squad flunkies are pretty easy to beat. Rude does have some good spells, such as Bolt2 and Cure2, but if you watch out and keep healing yourself, there's really no reason you shouldn't win this fight. This is one of your two chances to steal the Ziedrich armour from Rude (the other time is in the sunken Gelnika). It pays to steal it, as it is arguably the best armour in the game. In the rocket, there's one more bad guy to beat. Enter the cockpit and a cutscene follows. Cid's workers leave the rocket to Cid, and then you hear that Palmer is launching the rocket. Once in space, you can go fetch the Huge Materia by using the ladders to the right. The combination lock needs button key presses; if you get it wrong, you have three minutes to get it right, so listen to Cid's ideas. The correct combination is · · · Enter · (. or Delete) · (0 or Insert) · (0 or Insert). Functionally for those who have alternate controls: OK - SWITCH - CANCEL - CANCEL. Note if your have changed you controls, you must input the controls to what you changed them too instead. To get to the escape pod, go left. There's a cutscene involving Shera, who shows up and leads you to the pod. The rocket will hit the Meteor, and won't cause much damage to it at all, even if you leave the Huge Materia in the rocket. Red XIII suggests going to ask Bugenhagen what to do next, and that would be prudent. However, at this point the immediate danger is gone, and you can explore a bit if you want. Take the submarine and visit the sunken Gelnika near Costa del Sol. If you sunk the Red Submarine and didn't grab the Huge Materia yet, go and do that. If you have the Guide Book, visit Kalm to exchange it for Underwater materia, even if you are way too weak to face Emerald Weapon right now. If you were victorious in saving all the Huge Materia, it would be a good time to give them all to Bugenhagen. Leave them to his care when you visit Cosmo Canyon and ask the old man what to do next. If you got all the four Huge Materias, the Bahamut materia and the Neo Bahamut materia, touch one of the Huge Materias to get the Bahamut Zero red materia. This page was last edited on 1 April 2015, at 23:32. This page has been accessed 191,503 times.